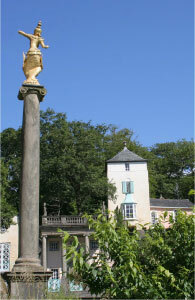 A golden Burmese dancer balances atop an Ionic pillar in Portmeirion’s piazza. Telford’s Tower rises in the background. Every fairy tale has a twilit undercurrent, but Sir Clough Williams-Ellis’ fantastical village of Portmeirion casts a shadow of gold. Recall the fairy tale of Jack Horner, concerning a knight from a “vastly ancient and noble family” whose members had the exclusive honor of “being born with shadows of gold-leaf attached to them instead of the vulgar grey and sometimes black shadows that adhere to common people.”1 Clough was certainly a godson to that knight, for the brighter the sunlight, the brighter his architectural silhouette. Like a modern Phantasmion, Clough traced the outline of his radiant shadow to create a seemingly substantial village of “redoubled brightness” and “many-colored radiance.”2 There are no secret skeletons tucked away in dark closets at Portmeirion—every embarrassment of riches is proudly on display, and every cloister is not only doorless but open on both sides. Still, shadow hunters must tread carefully, for delicate gold-leaf tears easily. Indeed, fragility reflects off every gaily painted stone and whimsical adornment in the village. 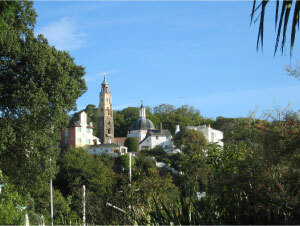 Hidden in plain view, fragility is the true secret of Portmeirion’s exquisite charm. A view of the village from the Camera Obscura. Portmeirion weaves its story from wispy threads gathered all across Europe, layering themes upon themes into a billowing tapestry where everything old is new again. Each building rose from secondhand rubble, antiquated bricks and ornaments repurposed and reborn to tell an alternate history—a future history, even. “The true fairy-tale poet is a seer into the hereafter,” suggested Novalis (c. 1799). “The genuine fairy tale must be prophetic description—idealistic description.”3 Clough was a one-of-a-kind prophesying poet, his imagery so vivid as to invite pilgrims to step inside and experience eternity firsthand. In this unconventional guidebook we will explore Clough’s trailblazing experiments in virtual reality, his subtle but powerful time-warping and space-folding tricks, the little-known myths and legends echoing down every footpath, and the myriad restless spirits at play. Eccentric globe-trotters will have their eyes opened, curiosities piqued, intellects tickled, feet motivated, and pens recording the most fascinating entries in their travel diaries, bar none.